Quitting eBay Completely, A New Blog & £12k on Amazon UK in My First Month! It has been almost 4 months now since my last blog post but it feels like YEARS! What started as a quick summer break slowly extended into a more complex transition time for me, my businesses and this blog. Especially the blog as you can see – we now have a brand new look & layout for it! I know that it’s hard to accept something new but I really hope you like how it all turned out and will get used to the new design very soon. I’ve actually started to receive emails from long time blog readers asking whether everything is okay with me! Luckily I’m all good and actually in better shape than ever before! But I will leave that story to January, when it’ll be one year since my “Get Fit” start date. Anyway, back to the question at hand – what have I been up to for all this time? 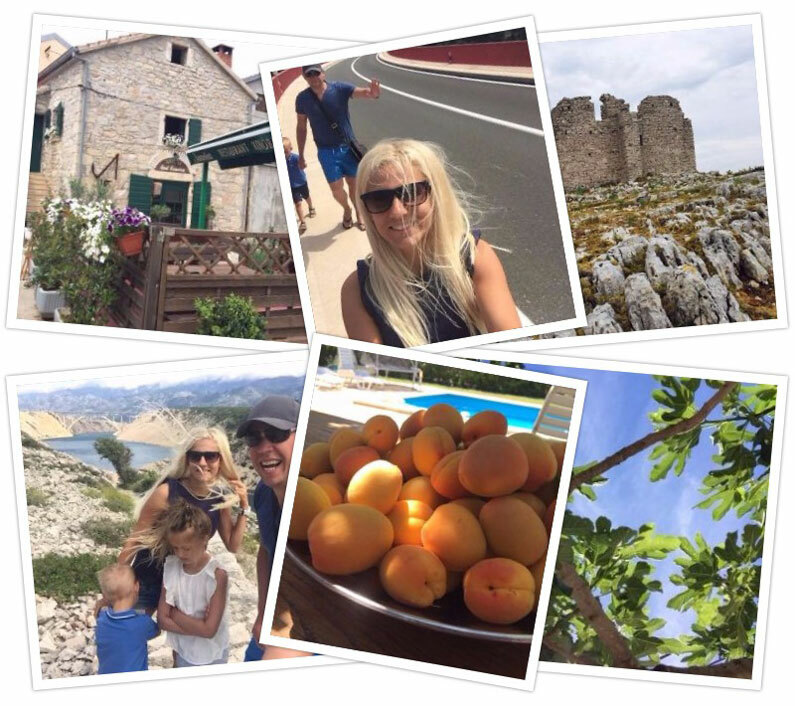 To start with, in the beginning of the summer, I went on a long awaited holiday to Croatia with my family – it was in the beginning of June, when the season over there technically hasn’t even started yet but for us it was perfect! 10 days with no rain, 30 degrees, a swimming pool and lots of relaxation. At that time I didn’t even know that a major change for me and my business was just around the corner. You have probably already noticed that something is different about the blog now? That you see Amazon on every corner, and not eBay anymore? Long story short, I quit eBay in August this year. Yes, after 10+ years of selling on eBay I stopped trading there completely and I have no plans to go back anytime soon (probably ever). Why? Basically what happened is that the two Amazon businesses I started in 2015 and 2016 improved so much in sales over the summer that I asked myself – why the heck do I need eBay anymore as I get such a better ROI on Amazon? 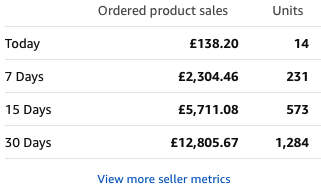 And not only a better ROI money wise, but time wise too – as on Amazon I’m fully relying on FBA for order fulfilment so my businesses basically run on their own, 24/7! So I decided to leave eBay behind and fully concentrate on Amazon. I managed to launch a new company and brand, my 3rd business on Amazon, in the beginning of September and in just the first month sold almost 1200 units!!! You can learn more about that in the new video I have created on the blog (if you haven’t done so already). When you enter your email to access that video, you are at the same time subscribed to this blog’s newsletter and will receive an email when new content is published. This is something many people have asked for and I’ve finally implemented it! 1) How the search algorithm works on eBay. Basically, price nowadays is the number one factor in eBay’s ranking system! If you can sell a product for a lower price than anyone else, you’ll get ranked in top positions. No matter how good or bad your product is. You can get multiple refund requests, get a lot of bad feedback etc. and still eBay will rank you high enough. The problem is that you won’t make much money, but who cares, right? 2) eBay has become a bargain hunter’s paradise. And this is basically the result of how eBay ranks listings. eBay customers now expect super cheap deals on EVERYTHING! Sometimes it seems that everything can be bought for just a few quid on eBay – be it a silicone spatula or laptop stand! How can you make a business out of it? When you make pennies on a £10 sale? And I won’t even talk about all the unfair competition from sellers who do not pay taxes, do not register for VAT, or sell fake goods. Basically, if you want to create a business with decent margins, that can sustain overheads, employees and growth, eBay is not the place to do it as you will always compete on the lowest price. If you have followed my blog for some time, you’ll know that my strategy is to sell HIGH quality products at higher prices to maintain good margins and NOT get into the low price game. But this has become more and more difficult on eBay as you simply can’t get enough traffic to your listings PLUS people can’t really see which products are good and which are cheap, low quality rubbish. In my opinion eBay failed totally with the review integration, just like they have failed on everything else they have tried to copy from Amazon (5 years after Amazon does it). Amazon is a totally different world! It’s built for people who want to maintain high standards of trading, create awesome brands and HIGH quality and even PREMIUM products! Unlike eBay, rankings on Amazon are massively influenced by the reviews you receive. You simply can’t sell rubbish, low quality products there! After the first few bad reviews, your listing will go down in search, to page 10 where no one will ever see it again! Product quality is everything on Amazon and Amazon customers are actually looking for high quality products. This is perfect for people like me who like to sell the highest quality version of the product possible, charge premium prices and achieve healthy margins! It’s not like I realised this just a few months ago of course. I have been involved with Amazon since 2015 but it took me some time to fully understand how it all works and see the enormous potential of what Amazon offers, with all the regional sites and especially the hands-free order processing via FBA. And the turning point was really this summer when I saw that my Amazon sales were increasing while my eBay sales are going down, month over month. 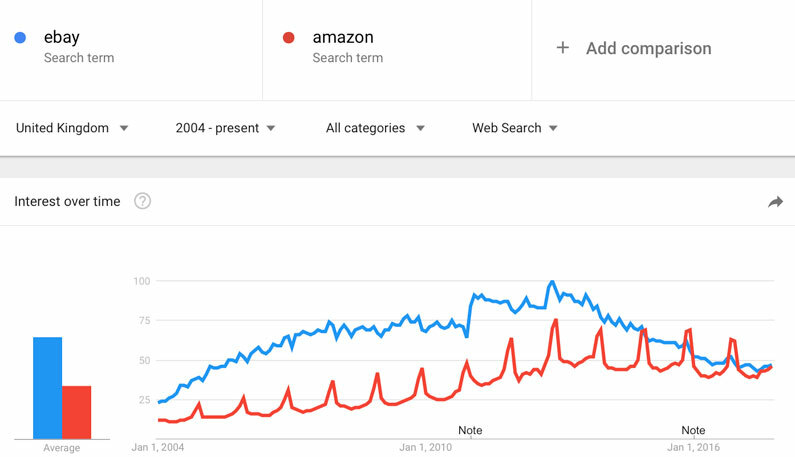 Then, for the first time I actually did check the popularity of Amazon and eBay via Google Trends and the picture was shocking! As you can clearly see, in the USA, Amazon basically out-competed eBay at around 2011-2012 and since then it has continued its growth in popularity year on year. Basically right now we’re at a cross-roads which we’ve already witnessed in the US – Amazon is continuing to grow while eBay is slowly dying…. 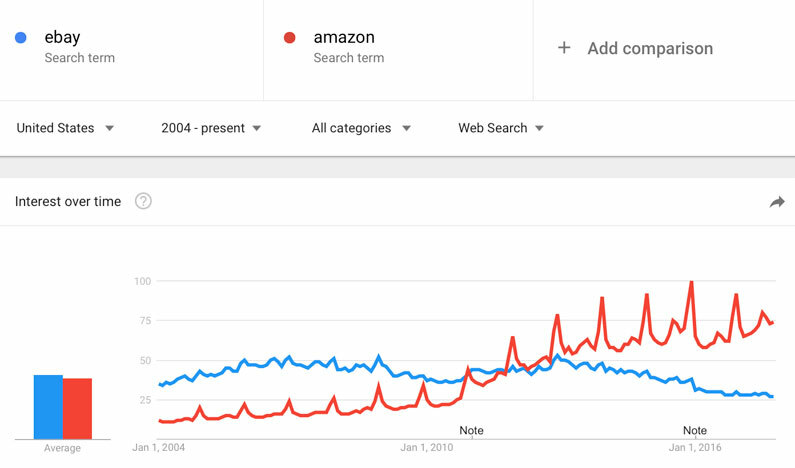 Obviously Google Trends is not the most sophisticated market research tool but it just double confirms the feeling I had – that Amazon is taking over the world while eBay is totally messed up with all the problems they have been dragging on for years. And as I said, it’s not only about the increase in sales/traffic Amazon generates but more about the fundamental differences between these two marketplaces. And from now on, I choose to continue my online selling journey with Amazon. This means that on this blog, I will cover all things that are related to selling on Amazon, including importing from China, branding and everything else of course. This also means that I have closed the Easy Auction Business course as I can’t really promote something I don’t believe in anymore and provide support on issues I have no experience with. EAB was online 10 years (maybe that’s a sign?) and it helped thousands of people to start an eBay business but that era has ended now. It’s time for something new, something more powerful. I will of course continue providing support for existing EAB customers but I won’t be producing any more new content. I will also keep running Spicy Auction Templates even though I think the best choice would be to sell it off to someone who is into eBay or an eBay template design company as I won’t have time to grow and promote it further. As for the 60 Day Blueprint program – I’m also closing it down, for good. Right now I’m working with my last group of people and we’re of course doing Amazon already, not eBay. For the last few months I have offered the Amazon route to my 60DBP customers and most of them of course agreed with me and went with starting an Amazon business. But I’m not closing 60DBP solely because I don’t sell on eBay anymore. The problem is that 60DBP takes so much time and energy from me that I simply can’t afford to continue it anymore. I have my hands full with my Amazon and eCommerce businesses now and it’s simply not possible for me to offer personal chat sessions at that price and format anymore. So what does this all mean? Is this the end? This is actually the beginning of something much better – something that will create many millionaires over the next decade! To be honest, I haven’t been so excited about my business for a very long time! Seeing how well I’m doing on Amazon, seeing sales increase month on month, and feeling that my concepts just work – it’s amazing! I have already planned out 2018 and I can’t wait to implement it all in real life. As for this blog – I will try to publish 3-4 blog posts a month and will of course continue to personally answer your emails and comments. I will just concentrate on Amazon, not eBay. 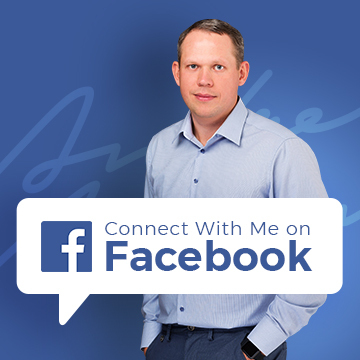 I will also start using Facebook more – as often I just have a quick idea or news story I want to share and I won’t do a blog post about it. I will simply publish it on Facebook. So if you haven’t done so already, follow my Facebook page here to ensure you get all updates. What’s more interesting is that I will actually use more real life examples from my Amazon business to keep theory to a minimum and talk more about real life situations, examples, problems etc. And that’s not all – I’m already working very hard (when time allows) on my new video course – Amazon Sharks, which will be launched in January 2018! 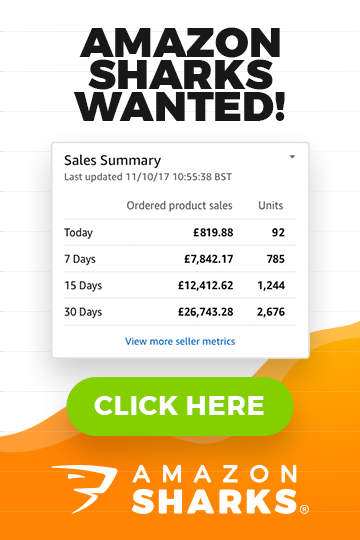 It will be the ULTIMATE Amazon training program for anyone who wants to create an amazing business on Amazon UK and beyond. In more than 150 video lessons I will teach you exactly what you need to do to create a highly successful Amazon business. In the course I will reveal my own business (for the first time ever!) and will basically guide you through the whole process from A to Z! And it won’t be an ordinary video course, no, it will be a 10 week self-learning program with CONSULTING built into it! Basically, you’ll receive video materials each week with exact step by step instructions on what you need to do AND at the same time you’ll get my personal online support. I don’t want to reveal it all now, but make sure you head to the Amazon Sharks website and sign-up to the waiting list as the program WILL be highly limited! Right now I’m thinking of doing 4 groups a year, 30 people each, but we’ll see what my final numbers will be. 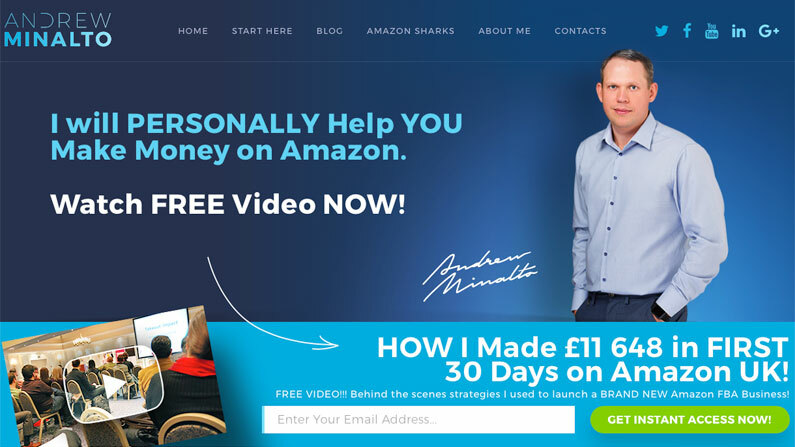 For now, if you haven’t done so already, sign-up for my new FREE video on how I made £11 648 in my first 30 days on Amazon as it’s truthfully very valuable content that you DON’T want to miss out on! I am so jealous of anyone who has walked away from eBay. It is currently my main source of income. The plan was basically to start funneling over to FBA, but both platforms have been inconsistent at best lately. Anyway, great post, and beautiful family. Congrats on your successes! You can do it too – you may be required to change/adjust your product portfolio but you can do it! Last year I began reading your blogs on Ebay and it all sounded good but I didn’t get the chance to make a start. I’ve come back now (and just subbed to Terapeak for a year) and seen that you’ve switched to Amazon so of course I am wondering if I should now forget Ebay and follow your Amazon blogs. However, sorry to ask, (and I may have missed a statement on this) but could you confirm if you are receiving any benefit from Amazon for promoting their platform? I also notice that Terapeak was sold to Ebay in Dec 17 but don’t know if you were connected to the development of that. It is your choice of course but personally I have never regretting moving away from eBay. In fact, it’s one of the best business decisions I have made! I’m really enjoying selling on Amazon and still can’t believe how little time (or no time at all to be precise), daily maintenance tasks take on that platform. As for Amazon paying me…. I wish I would, lol! 🙂 NO, of course no – Amazon does not pay me anything and don’t think they will ever do such a thing. Hope this helps & let me know if you have any further questions. i am so excited that you are back! are you not worried to put all the eggs in one basket, especially with amazon that can throw you off at any time( for a tiny mistake of for example logging in from a friends computer) there are allot of stories of account that have been top sellers and have done millions of sales for years and have been confiscated suddenly from one minute to the next for a tiny mistake. have you thought of this point? and how are you planning to address it and to make sure that it does not happen to do? Well, first off – I don’t have my whole business on Amazon, it’s only a part of it. And yes, things you describe can happen on Amazon, just like on eBay or PayPal. And we can’t do much about it…. I know there are paid services that can help with getting back Amazon account but hopefully I will never have to use them. Also, from what I have seen/heard from online forums etc., over last few years Amazon has become more seller friendly and don’t ban accounts just like that, for no reason. I have also found Amazon customer service very good, they’re always available on Live Chat and Phone. My accounts right now are in pristine condition metrics wise. This is great to hear your back, I moved from ebay to Amazon over two years ago and the potential on Amazon is so much bigger and greater than eBay. Two different leagues in my opinion. Looking forward to the great content you provide in your blogs before, Thanks Andrew! Thank you for all important information you are publishing on your blog. I do really appreciate that and enjoying reading these articles… I have noticed, that you have changed your strategy of business and concentrate on Amazon, solely. Recently, I did become member of EAB, E-commerce magnates and Spice templates. I want to make sure, will have access to all these members only concepts and will be able to see them videos, after all these changes. Anyway, your new blog design seems excellent. Yes, absolutely! Don’t even worry about that! All the courses/programs I have created will stay online and customers will get access to materials for as long as they need them. Yes, there will be a discount and early option to sign-up for EAB customers. Your latest business venture is exactly what I am trying to do myself. I am a professional fba seller (mostly books, plus a few other things) I have recently been in contact with support regarding my new suggested domain names, 2 of them now registered. You have not responded to my latest posting on the support blog. I intend to follow you on your new venture.I have complete trust in your methods and would like to join you. I have not been able to completely devote myself to Amazon, because of other commitments I am now free of. I would appreciate it if you could respond to my latest posting, and tell us where we go from here. Please create a new ticket and ask your question as it seems that your old one was lost during the weekend server down time. I have been reading your posts for some time and bought an EAB course. I used some sales advice, but I did not use it as a business because the Czech government is very restricting small businesses by inventing the so-called Electronic records of sales (http://www.financnisprava.cz/en/financial-administration/ electronic-records-of-sales). The only thing I went to is eToro and thanks to your advice, I’m starting to get some good results thanks to you. I want to ask. It is possible to start a successful business in the Czech Republic on Amazon even though the main sites are Amazon.co.uk and Amazon.de Can I ever compete? Thanks. YES! You can sell on Amazon.co.uk, Amazon.de and even Amazon.com! You can sell on Amazon, use FBA just like anyone else. And unlike with eBay, the use of FBA means that you will compete with local sellers on exactly same level. I will have a special video on how people can do this in my Amazon Sharks course. I am very exciting for your Course. But I am in Germany. Is this Course will be helpful for me and I did not sell any thing before online?. Is there difference between Amazon in Germany and England? Yes, it will be suitable for you in Germany too. Amazon Uk and Amazon in Germany work exactly in same way. Plus I will also teach how anyone can sell on Amazon UK WITHOUT being in the UK. Good to see you blogging again. Really loving your new product line on Amazon, I’m sure it will do really well! In 2011 I was using eBay uk and PayPal for selling purpose and I stopped in 2015 because of no proper documentation of my business and there was a pending balance to be cleared on eBay which I couldn’t make the payment as my account was blocked and later on eBay released my account but I came back to my home country (India) and couldn’t get a chance to clear that pending fees of eBay and now I don’t even remember the login details . So my query is that can I open a new eBay account from my back home or is there anything which will be interlinked from eBay UK to any other countries, or is there a chance of account suspension in future as the eBay UK fees is pending. Does this happens? Is eBay UK and eBay India are interlinked. Not sure whatever eBay UK and eBay India are inter-linked or not…. probably they’re to some extent. But if you’re now in India, use different address, email etc., I don’t think you’ll have any problems opening a new account. I also haven’t been as excited as I am for my business since early days of starting! hi Andrew good to have u back & i was afraid that something went wrong but in your last email you told me all was well. I have tried to sell in Amazon Germany for somtime. But am not getting approval for most Goods because Amazon says they are not new. But maybe with your new Blog i can find the loop holes. You have been a Mentor to me on my Ebay Germany. Hope this continues on Amazon. Amazon.de is yet another, HUGELY un-tapped platform right now. It’s few years behind UK site which means that best is ahead of you! Not sure how exactly gated categories work on Amazon DE but you shouldn’t have to ask for approval for “normal” categories like Home, Kitchen, Garden and similar. Anyway, I did gain some good leads in China and have bought three excellent niche goods at competitive prices. Just this week, my listings were clobbered with the new SSL requirements for outsourced images, which I set up as per your EAB course. I actually still have an old Amazon business account from years ago, so can I assume that I can simply re-start using that, once I know what is entailed in the Amazon plans you have? I have noticed that after the initial success on eBay, things have dried up a little, maybe due to my listings being deemed `insecure` until I got the SSL sorted this week (Costing £40 a year!). Is it as straightforward as migrating my listings to Amazon? Yes, of course – your Amazon account doesn’t “expire” and you can start selling with it any time you want. It’s not like you’ll be “transferring” listings from eBay to Amazon as on Amazon there’s totally different system – you don’t use HTML templates like on eBay and there are other differences. If you can wait till January when Amazon Sharks course comes out, I would recommend doing that as then you’ll have a step by step system you can follow to start selling your items on Amazon. Good to see you back blogging Andrew. I don’t blame you quitting Ebay, I wish I could get away too. But Amazon won’t approve my application to sell Jewellery because my supplier isn’t official enough for them 🙁 I’m trying to make a go of it on Shopify and Etsy but nothing so far is bringing in enough money to keep me going without Ebay. Have you tried doing few small orders from other – more “official” UK suppliers? Just to get invoices for Amazon approval? Good idea I will have a look. Most of them are too expensive for long term use but If I only need 3 invoices for amazon it’s a small sacrifice I guess. Hi Andrew, Great new look and timing is perfect for me as we are doing OK on ebay but fed up with unfair reviews, crazy demands by ebay and lack of support for genuine businesses. We are building our own ecommerce site but may well run it in parallel with Amazon. So I’ll definitely sign up as the advice we’ve had from you so far as been brilliant..
And def. at least give Amazon a try, it’s well worth it! Welcome back Andrew and congratulations on the new setup. Look forward to reading more and learning about your success with amazon. I have tried on two occasions to get started with amazon but struggled to get things up to a sustainable level. I’m really excited to share more information on Amazon selling as I feel that for many people it’s still totally confusing eco system. And this is probably while Amazon is so great right now – many people who sell on eBay simply haven’t properly learned Amazon and they just stick with eBay. Thanks for your comment and stay in touch! Thank you for coming back, where can we see details/ prices on the course? All the details, pricing etc. will be announced on this blog and Amazon Sharks website in December/January when course goes on sale. Right now I can’t give you those details as it’s all in the process. Hey Andrew great to have you blogging again. I always wanted to do Amazon FBA,but it seems the best courses teach you how to sell on Amazon US and not Amazon UK. Looking forward to your course. Yes, there’s very limited info on the Amazon UK.